Looking out in the garden this afternoon, I was greeted by a reemergence of Chenopodium bonus-henricus, which is commonly known in English as Mercury, Goosefoot, Smearwort, Allgood, or Good King Henry. The latter term is the one that I find to be of most interest. This plant actually has nothing to do with any King Henry, and any reference to a king is absent from both the taxonomic name and the Deitsch name, both instead meaning "good Henry," or, perhaps more accurately, "good Heinz," "good Heinrich," or "good Heinzelmann." These terms all translate to a variety of wights and gnomes, thereby relating the plant to magical uses associated with Elves and Kobolds (see Grimm, Jacob. Teutonic Mythology, vol. II. New York: Dover Publications, 2004, pp. 501-509). Modern depictions of Elves show them as being friendly to humans; indeed, some lore implies that some male human spirits go on to reside with (and to be counted among the Elves). However, there are also many indications that Elves are inclined to follow their own agendas and sometimes find humans to be annoying. Thus, their actions may sometimes even be detrimental. For example, there are quite a few compound words in Deitsch and concepts in Urglaawe that contain a form of "Elf" and carry a negative connotation. "Der Elbekeenich" ("the Elf King) appears shortly before one's death. The Elbedritsch is a trickster figure who can mislead those on spiritual journeys. A nightmare is an "Elbdraam" ("Elf Dream"), and an "Elfschuss" ("Elf Shot) is a sudden pain that appears in humans. In the case of the latter two, there is some oral and written lore that indicates that the Elves may be presenting the dream or the shot as part of a service provided to a deity or an ancestral spirit in order to convey a particular message to the humans. Typically, an Elf Shot is not seen as resulting from a human sorcerer. However, there is an indication of there being one way for humans to employ Elves for hexes. "Guder Heinrich" is differentiated from an unrelated, highly toxic plant called "Schlechter Heinrich" (Mercurialis perennis or English: Dog's Mercury). In terms of esoteric beliefs, Guder Heinrich can be used magically as an offering, particularly through burning as incense, to Elves or other Wights to aid in a particular effort. Likewise, Schlechter Heinrich can be used in a similar manner to employ Elves for nefarious duties. Schlechter Heinrich is highly toxic and should not be ingested or handled recklessly. Likewise, the casting of hexes is equally toxic to the spirit. Fortunately, Guder Heinrich, when offered as incense, can break hexes brought about through Schlechter Heinrich. Additionally, Guder Heinrich is said to be sacred to Berchta. The leaves of the plant are in the shape of a gooses' footprint. Since Berchta has a splayed "goose foot" as a result of Her spinning, the appearance of the leaves most likely serves as the connection to the goddess. On a less esoteric level, Guder Heinrich has medicinal and culinary uses. 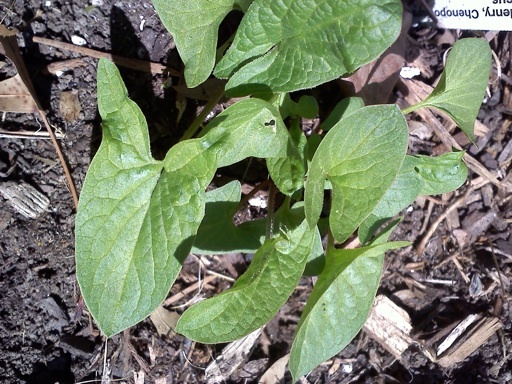 Although spinach has pretty much replaced Guder Heinrich in cookery, the plant may still be used as "poor man's asparagus" or as a side dish with rabbit or goose. Deitsch botanist Christopher Sauer (Weaver, William Woys. Sauer's herbal cures, pp. 158-159. New York: Routledge, 2001.) describes Guder Heinich as being a temperate herb with watery and nitrous salt elements. He saw it as a good herb for dissolution and stilling of pain and for helping to create good blood. He also saw it as a good poultice for angry wounds and as a constituent in a salve for hemorrhoids. Historically, a plaster of the leaves was frequently used to treat gout (Deitsch: die Gicht). Additionally, Guder Heinrich is also used medicinally to treat anemia (Chevallier, Andrew. Encyclopedia of herbal medicine, p. 188, New York: Dorling Kindersley, 2000). The plant may be consumed like spinach. Below is a Guder Heinrich Smoothie that is a modification of a Dark Green Smoothie published by Deitsch Master Herbalist, Rachel Weaver (Weaver, Rachel. Be your own "doctor," pp. 256-257. Reinholds, PA: Share-A-Care, 2010. Disclaimer Again: This information is for educational and discussion purposes only. Nothing in these posts is intended to constitute, or should be considered, medical advice or to serve as a substitute for the advice of a physician or other qualified health care provider. Combine all ingredients (you may start with 1 banana and one tablespoon of pineapple and then add to taste) and completely liquefy all ingredients. I followed Weaver's advise to throw in a few ice cubes to make the drink nice and cold, and I enjoyed it. Weaver advises drinking two cups, refrigerating the remainder and then drinking throughout the day.